Food gatherings: Stuff a grocery bag or two. St. Paul mounts two large food in-gatherings each year. Canned goods and boxed cereals mean care for hungry people in our community. Everybody participates – young and old. Our gifts of nonperishable food help stock the shelves of the Friendly House Food Pantry in west Davenport. The Salvation Army meal site is part of the vast feeding network of Churches United. Nearly every month, St. Paul teams cook and dish up an evening meal. Find your place in the serving line. Café on Vine serves more than 4,000 noon meals each month. St. Paul offerings and hands support this outreach. Home-cooked meals are a gift of care and companionship. Table Graces is a St. Paul ministry that provides “comfort food” at important life transitions – like the birth or adoption of a baby or a recent hospitalization. Teams cook, assemble, and freeze meals in the church kitchen. It’s steeped with joy. And later, when needs arise, meals are ready to pop out and deliver. Madison Market is a River Bend Foodbank school pantry located in the J.B. Young Opportunity Center, serving neighborhood children and their families. This partnership serves hundreds of people each month. A garden grounds us in the simplicity and daily grace of hard works. It’s the dirt under the fingernails. It’s faith that a tiny seed will become a red August tomato. It’s sharing food with others. The St. Paul Community Garden takes root in plots in the block to the south of St. Paul. Stroll into the garden on a summer’s day. Catch a whiff of the basil. Volunteer to sow seeds, pull weeds, water the beds, harvest veggies. Help a child pat soil around a tender tomato plant. And give thanks for plenty of hands bearing trowels and watering cans. The garden’s abundance goes to feed people who are food insecure at Cafe on Vine and the Madison Market. ELCA World Hunger declares: “It takes more than meals to feed a world.” ELCA World Hunger gets food and life into areas of critical need. Development, education, and advocacy focus on ending global hunger and poverty. Kids Against Hunger: Kids and grown-ups get into the act, measuring and pouring high-nutrition ingredients into bags. Hairnets and aprons are the accessories of the day. 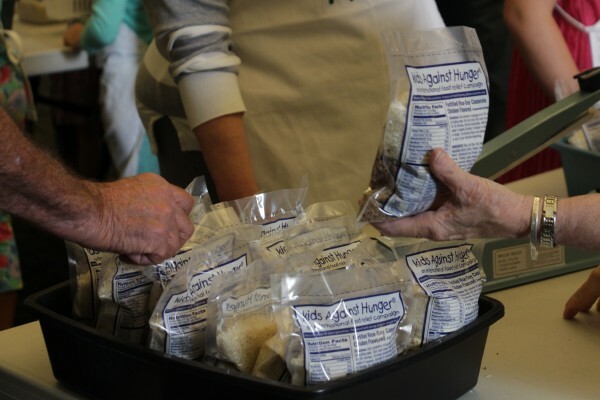 Help package up to 20,000 meals, targeted for a place of need in the world. Bread for the World: urges our nation’s leaders to end hunger. St. Paul gives generously to this powerful Christian voice. What can one person do? Plenty. Educate yourself. Write a letter. Advocate for justice.